With so many companies looking to source their materials right here in the United States, more businesses are searching for US-based companies to provide them with sustainable aluminum extrusions. Studies show that the United States imports a lot of aluminum products from other countries, in particular, unfinished aluminum, aluminum plates, and sheets. However, when it comes to the aluminum extrusion industry, most businesses prefer to stay local and contract their aluminum industry solutions a little closer to home. It is important to find aluminum fabrication shops that can provide you with all of the custom services and options that you require from the aluminum extrusion industry. Silver City Aluminum is a one-stop-shop for all of your custom design, extrusion, fabrication, and finishing needs. Why Choose Custom Aluminum Extrusion? Unlike standard profile shapes, which can be limited to a degree in the amount of function and options that they provide, custom engineering and design of profiles can help save companies time and money, two of the most valuable assets in any industry. Aluminum fabrication shops like Silver City Aluminum work with each client to create a specific die or profile that meets their requirements, reducing secondary operations along with costs, time delays and providing a better all-around finished product. The shapes that are created by the aluminum extrusion industry are not possible with other metals. The aluminum billet is heated to a specific temperature to soften it and make it more malleable. The aluminum is then forced through the profile shape using 10 million pounds of pressure to create the resulting piece. The aluminum is stretched and cut according to the specifications of the client to produce the parts, components, or products required. This helps to reduce waste, improve lead times, and provide better quality results for today’s fast-paced industries. Did you know that more aluminum is produced each year than all of the other non-ferrous metals combined? Aluminum is very cost-effective, completely recyclable, has many valuable characteristics, and is widely available. Aluminum fabrication shops use alloys that are highly resistant to corrosion and dust. 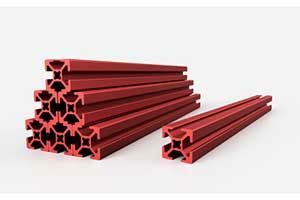 The sustainable aluminum extrusions are formable, weldable, workable, and provide an unmatched low weight to high strength ratio that is extremely attractive to the automotive, transportation, and aerospace industries. In our Massachusetts aluminum fabrication shops, we are able to meet even the most challenging requirements of our clients. From high-quality standard profiles to more elaborate custom aluminum extrusions, our team of highly trained engineers and technicians can help you to achieve your goals. We are dedicated to providing the very best industry standards for quality control and service to each order that we fill. To learn more about our options for aluminum extrusion industry solutions, give us a call at 508-824-8631 and speak with one of our team members to discuss your needs for sustainable aluminum extrusions.